This is our About Us page - Who we are and why we started this web site. Hi, and welcome to my web site and thank you for taking the time to stop by. My name is Ron Gouge and I'd like to tell you a little bit about myself and my background and why I built this web site as well as how I, someone with absolutely no web site building knowledge, did it. That's my wife and me there in the picture. A bit younger than we are now, but we figured what the heck, what's a few years among friends. Right? 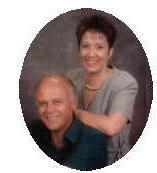 Plus it's the best picture we have of us and I thought we should look as good as possible on my web site. I'll try to paint a picture, in words, that will help you to see why we're so passionate about the toxic chemicals we all come in contact with each and every day. So now for a bit of history on us and how we ended up as advocates for a lifestyle centered around making natural and organic choices. We live in a town of less than 200,000 in the desert South East portion of Washington State. Yup, that's right, I said desert, desert in the Evergreen State. Seriously, it is desert, with sand, sagebrush, tumbleweeds, jack rabbits, coyotes and rattlesnakes we got it all. But we do have a couple of pretty big rivers, the Columbia River and Snake River, that run through here. Those rivers, and a couple of smaller ones, make it possible for this area to be an amazing agricultural oasis. This area is fast becoming a huge grape growing and wine making center. It's possible to grow almost any crop here, just add water. We both pretty much grew up "down on the farm" so to speak. My wife was born here and raised in a small farming community just a 10 minute drive from where we now live. My grandparents on both sides made their living "from the soil" one from farming and the other from a nursery. We spent our summers at one or the other. We were both raised to conduct our lives according to the golden rule or as some call it, the ethic of reciprocity. Basically we both believe that you should treat others as you would want them to treat you. This upbringing has lead to both of us often getting involved in situations that most people would have looked at and said, "that's a waste of time, it's not going to change". It's also the deep rooted driving force pushing us to use this web site as a means of sharing much of what we have learned over the years. My wife worked for many years in the medical field, which afforded her the opportunity to help others. Something she misses very much and would love to go back to some day. Circumstances beyond her control dictated a job change. She took an office job at a very large government nuclear site near where we live. She has been there now for over 20 years. One of her first job assignments was working in a building that was almost 50 years old. The building was showing the signs of age and really needed to be torn down. We would learn a year or so after she went to a different job location, that old building had been closed down due to asbestos contamination. A condition, we would later learn, existed during the time she worked there. Talk about being angry, you have no idea. Only time will tell what the consequences of that exposure will be. As for me, I spent 30 plus years working at that same government site. The last 15 years there I worked as a hands-on chemical and radiation worker. My job included working with hundreds of toxic chemicals, radiation, radioactive materials, as well as chemical and radioactive contamination. It didn't take very long for me to realize that working with the hundreds of toxic chemicals, radioative materials and contamination was not a good situation. The other workers and I were being exposed, as part of our daily duties, to so many hazardous substances that each day on the job was like a spin of a roulette wheel full of future health problems. To the left you see an example of clothing that I wore quite often on the job. This could be called the "leisure suit for radiation workers" or "the on the job weight loss program". Now is that classy or what? We received training about the chemicals, radiation and contamination and how to work "safely" with them. I didn't feel that this training was anywhere near adequate. I started researching and learning about the potential life altering effects of exposure to these toxic chemicals, radiation and contamination. It didn't take long before I realized that the "safety" training we were receiving was nowhere near sufficient. Well, the way I was raised, if you see something that's wrong you don't keep your mouth shut, you at least try to get it changed. I often went to management and voiced my concerns. This usually got some level of lip service but most often that was the extent of it. Nothing really changed for the better. Not getting the desired response from front line management, I started working my way up the management chain. Which branded me as a bit of a trouble maker. Know what I mean? Next thing I know, I'm in Washington DC answering questions at the US Department of Energy Headquarters (DOE/HQ). Over the next few years I made several tips to Washington DC to give presentations to the DOE/HQ Safety staff, a couple of times even to the Director of DOE. DOE eventually established a worker training program which used hands-on workers to write course materials and teach the classes. I was honored to be one of the first 4 workers selected nationwide to teach these classes at DOE nuclear facilities all over the United States. The research and study we did for that training raised my understanding, as well as my concerns, about chemical and radiation exposures to a whole new level. For the next 5 years I spent more than 50% of my work time preparing for and teaching health and safety classes all over the United States. I soon began to realize the magnitude of the lack of concern and available information about chemical exposure, not just at work, but at home as well. As I learned and shared what I learned with my wifecai we came to the realization that we needed to make some serious changes in our own lives. There was no way we could foresee the major changes to other areas of our lives which would come a few years later as a result of these working conditions and this decision. We began educating ourselves, searching and researching, looking for information and resources to make these important changes in our lives. As so often happens with "converts", some of our family and friends felt that it had became a bit of an obsession. Like most worthwhile things in life, making these changes wasn't a quick, inexpensive, easy or convenient transition and certainly not without its challenges. We have learned many, many things about how we are constantly being exposed to toxic chemicals every day, often times from things which one would never suspect as a danger to our long term health. I was on the road an average of 2 out of every 4 weeks teaching classes or doing research. At some point around 4 years, and several hundred thousand air miles, I started to burn out. The original group of 4 instructors had grown to several dozen and, as so often happens, my duties were becoming more administrative than teaching. About this same time we learned of a supplier of health and nutritional products that was looking for private contractors to expand their market share. We checked them out and decided to apply. We were accepted and they wanted us to set "up shop" right away. After considerable discussion on the pros and cons of the situation the decision was made. I would leave my job of over 30 years to begin a new adventure. On the day before my 50th birthday I drove away from the government nuclear plant for the last time. At least I thought it was the last time. Over the next 4 years we learned some amazing, and often very disturbing, information about what we humans do to our bodies by what we put in and on them. Not to mention what we are exposed to from sources that we have very little or no control over. This work was very rewarding, from the standpoint of helping others, but the income was a bit erratic. Being a private contractor can be that way quite often. About a year into this new adventure, a gentleman at the U.S Department of Energy headquarters (DOE/HQ) safety department learned that I had left my job at the nuclear site. He called me and asked if I would be interested in being a "subject matter expert" on a team investigating safety problems at DOE nuclear sites nationwide. What an honor and what a challenge. Over the next couple of years I participated in several investigations. One of those investigations took me back to my old job site. I'm sure you can imagine how that went over with the site management. The "trouble maker" was back, only this time in an official capacity. After a couple of years DOE/HQ appointed a new Safety Director. He started to make "adjustments" to the qualifications for team members. One of those changes was that private contractors, like me, were no longer allowed to be members of the investigation teams. Having excess time on my hands, I decided that getting my Realtor license which would allow for a way to more than replace that income. So I studied for, and got, my Realtor license. The timing couldn't have been any better. Within a few short months my work with the health and nutrition company came to an end too. Wow, this private contractor thing doesn't have very good job security. I went into real estate full time. What a fantastic way to make a living, helping families sell their homes or find and buy the home of their dreams. Then in the fall of 2004 I began to realize that something wasn't quite right with me physically. It didn't seem to be anything major so I thought, maybe I'm just getting "old". Then I realized that wasn't possible I was way too young to be getting "old"! But my health continued to decline and I was starting to take days off from my work because of severe pain and I had essentially zero energy. That just wasn't like me, you see I've always been a bit of a workaholic. Over the next year and a half my health continue to decline until I had lost 55 pounds and was no longer able to function at all as a Realtor. Finally in the spring of 2006 after many doctors and many, many tests they figured out what was wrong and put me on prednisone, a very strong anti-inflammatory drug. Three and a half years after I initially started having problems the lingering issues from my illness and the declining real estate market made it clear that I would no longer be a Realtor. Because of my medical issues and age I was considered to be disabled and unemployable. I needed something to occupy my time, keep my mind active and, with a little luck, maybe earn a little money while I'm at it. I kept thinking that there must be some way to earn at least some income on my own with the Internet. As I searched the web something called 'affiliate' kept popping up in my searches. After several months of research, finding, categorizing and storing hundreds of affiliate programs I thought I was ready to build a web site and take on the Internet. It would be a grand web site, it could be the "Internet Mega Mall", where people could come to find anything and everything. Plus, I'd get a commission if they were to buy from the web sites I sent them to. All I needed to do now is build a web site. Build my own web site? Right, maybe if 'Internet Aliens' were to take over my computer and do it for me. Really, I was web site illiterate, I had absolutely no clue! I'd had web sites before, for training programs and in Real Estate. They were built by someone else, at considerable expense I might add. Even though they were expensive and looked great, they never ranked in the search engines nor had any traffic to speak of. Obviously I got my web site or you wouldn't be reading this. Also obvious is the fact that this is not an "Internet Mega Mall". What's not obvious are the reasons why I changed my mind about the "Mega Mall" and how I got to this point. That information needs to be told on another page. What I will say here though is, I found a company that provided me with everything I needed, plus a whole lot more, to learn how to build this web site, maintain it and get it found on the Internet. They make it possible for folks, like me, who have absolutely no clue to build a web site that gets great exposure. Another great thing about this company is that their system works great for anyone from the total novice, like me, right up to experienced web site builders. Maybe you're thinking you might like to try your hand at web site/e-business building or you'd just like to read the rest of my story. If so, you can follow this link to learn more about how to build a web site and see how they made this all possible plus, how you could have your own web site, if you wanted to that is. Well I've probably rambled on way longer than I should have. I hope you've gained a bit of insight into our backgrounds, plus the what's and why's driving this web site. My wife and I wish you, and yours, a long, healthy and prosperous life! You can go here to read about my web site building adventure.